This Addon Compilation is supposed to be a static configured All-in-One User-Interface for World of Warcraft Classic (1.12.1) Clients with the goal of being the same on every PC and every screen resolution, without the need of sharing and/or modifying a bunch of “WTF” folder configs between several PCs. This Interface is highly inspired by TukUI and beside from the addon’s code itself it includes a collection of Addons like: LunaUnitFrames, Bartender2, simpleMinimap, Prat, customNameplates, OneBag, WIM and alot of (all required) ACE2 Libraries. Note: ShaguUI is a dead project. It has been discontinued in the end of 2015 and does not receive any futher updates or bugfixes. You should have received an archive containing two folders (“WIM” and “ShaguUI”). 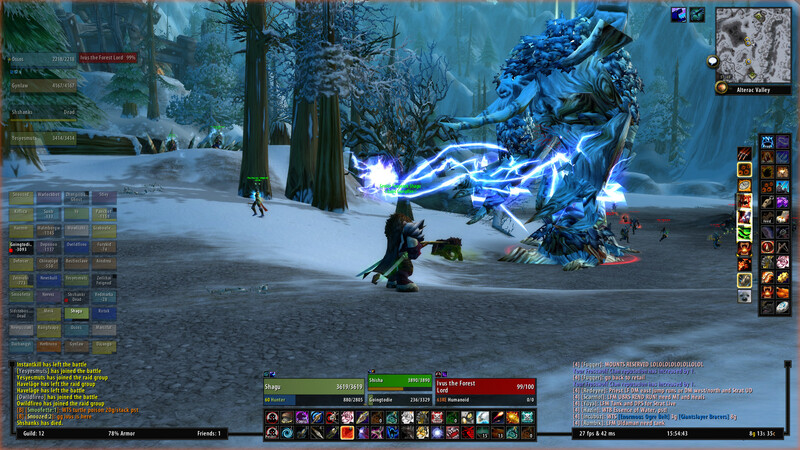 Copy them to your World of Warcraft Directory under Interface\AddOns. You should now have Interface\AddOns\ShaguUI and Interface\AddOns\WIM. If you experience errors, please try to disable all addons beside ShaguUI and clean your WDB folder before reporting your bug. If you experience bugs with other addons please check if you still got those problems without ShaguUI before reporting any bug to me. As mentioned before, this is a static Interface, don’t expect many configuration options without reading through the code. Nevertheless there is a configurationmenu which let you choose a few things many people wanted me to implement. To open that menu, click on the panel below the bottom-left chat window.